The ninth-century Great Mosque of Samarra is located in Samarra Archaeological City, a UNESCO World Heritage Site. The map shows Iraq, an almost landlocked country in the Middle East. Iraq has a short coastline at the Persian Gulf. The region lies within the Fertile Crescent; it is crossed by the river system of Euphrates and Tigris. Iraq was home to the ancient civilizations of Mesopotamia, the "Land Between the Rivers," also known as the land of Shinar in the Hebrew Bible. The Tigris and Euphrates valley was the site where humans invented urban living, the wheel, and writing, and it is one of the assumed locations of the Garden of Eden. Iraq borders Turkey, Iran, Syria, Jordan, Kuwait, and Saudi Arabia. The territory of today Iraq was very sought-after; it was the center of several consecutive empires the Akkadian, Sumerian, Assyrian, and the Babylonian empire. The Romans went there, the Persians, the Mongols, and the Greeks. The country became successively part of the Arab Islamic Rashidun, Umayyad, and Abbasid caliphates. After the collapse of the Ottoman Empire, Iraq was occupied by the United Kingdom. In 1920 it was declared a League of Nations mandate under UK administration, the country gained independence from the UK in 1932. With an area of 438,317 km², Iraq is somewhat smaller than France, or slightly larger than the US state of California. Iraq has a population of about 40 million people (in 2019), major ethnic groups are Arabs (75-80%), Kurds (15%), and Turkmens. Capital and largest city is Baghdad. 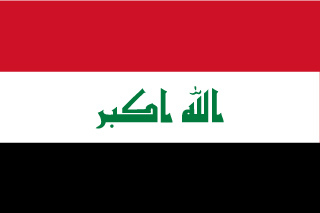 The official languages of Iraq are Arabic and Kurdish; other spoken languages are Turkmen (a Turkish dialect), Syriac (Neo-Aramaic), and Armenian. The official religion is Islam. 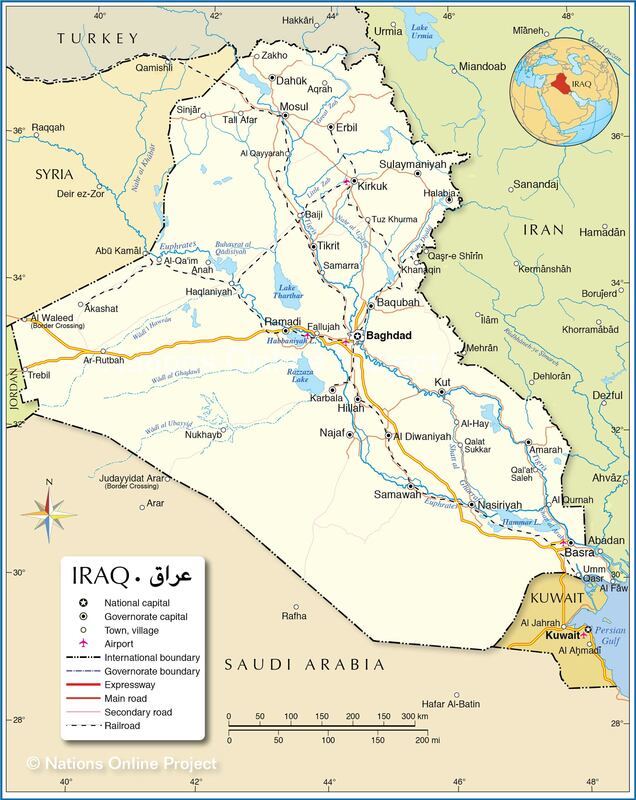 The map shows Iraq and surrounding countries with international borders, the national capital Baghdad, governorate capitals, major cities, main roads, railroads, and major airports. Imam Husayn Shrine in Karbala Iraq is the burial site of Husayn ibn Ali, the third Imam of Islam. Baghdad, the capital of Iraq, is located on the Tigris River. The city was for some time the capital of the Abbasid Caliphate, then known as Madinat al-Salam (city of peace). It was built between 762–767; the town became a center for Arabic science and trade and was home to the House of Wisdom, a library and public academy. Basra, Iraq's main port and economic capital is situated at the Shatt al-Arab (Arvand Rud) river, about 100 km from the Persian Gulf. Kirkuk is an industrial city situated in the borderland between predominantly Arab Iraq and the Kurdistan region in northern Iraq. The city is an important center of Iraq's oil industry and the "capital of Iraqi culture." Najaf (an-Najaf al-Ashraf) lies on the Euphrates River in southern Iraq. The city is considered sacred by Shi'a Muslims; it is home to the shrine of Ali, the fourth Rashidun and the prophet Muhammad's son-in-law. Within the metropolitan area of Najaf lies Kufa, a prominent historic city and famous for the Great Mosque of Kufa. Kufic, the oldest calligraphic form of the various Arabic scripts, was developed in the town. Sulaymaniyah (Slemani) is the capital of a Kurdish governorate of the same name in northeastern Iraq. The cultural capital of South Kurdistan is often described as a "cosmopolitan city." It is a popular tourist destination surrounded by several mountain ranges. Hillah is a city in the center of the nation, located on the on the Al-Ḥillah river, the eastern branch of the Euphrates River. The capital of the Babil Governorate is located adjacent to the ancient city of Babylon. Amarah (al-'Amarah), the former Ottoman military outpost is located in south-eastern Iraq at the site where the Tigris branches into two river arms. It is the capital of the Maysan Governorate. Nasiriyah, the capital of the Dhi Qar Governorate, was founded in the 19th-century. The city is situated in the southeastern part of the country on the banks of the Euphrates River. Nasiriyah lies close to the ruins of the ancient Sumerian city-state of Ur. 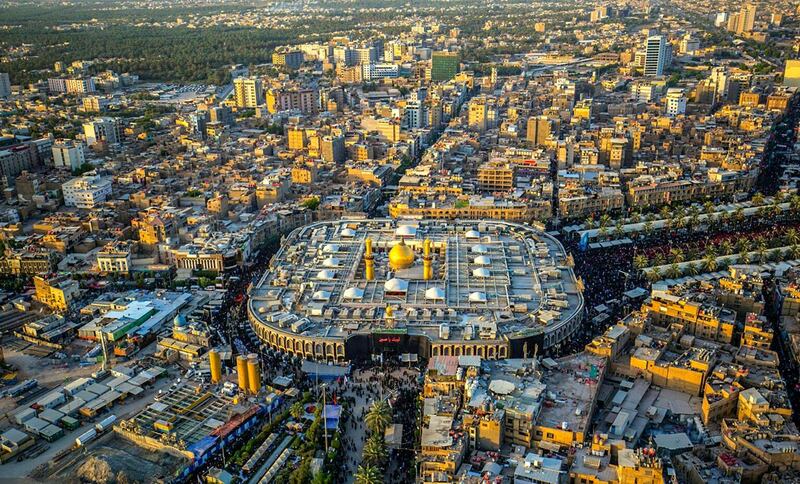 Karbala is the capital of Karbala Governorate and considered a holy city for Shi'ite Muslims. The city is home to the Imam Husayn Shrine, where Husayn ibn Ali, the grandson of the Islamic prophet Muhammad is buried. Samarra, the former Abbasid capital is situated on the east bank of the Tigris in the Saladin Governorate. The Al-Askari Mosque at Samarra contains the tombs of the 10th and 11th imams revered by Shia pilgrims. Samarra Archaeological City is a UNESCO World Heritage Site. Akashat, Al Diwaniyah, Al Qayyarah, Al Qurnah, Al Waleed (Border Crossing), Al-Hay, Al-Qa'im, Amarah, Anah, Aqrah, Ar-Rutbah, Baghdad, Baqubah, Basra, Bayji, Dahuk, Erbil, Halabja, Haqlaniyah, Hillah, Karbala, Khanaqin, Kirkuk, Kut, Mosul, Najaf, Nasiriyah, Nukhayb, Qal'at Saleh, Qalat Sukkar, Ramadi, Samarra, Samawah, Sinjar, Sulaymaniyah, Tall Afar, Tikrit, Trebil, Tuz Khurma, Umm Qasr, and Zakho.